Boost Libraries are divided into two categories, header-only libraries(no need to build) and libraries which require separate build. I will show how to use both types of libraries in a C++ program. 1.) 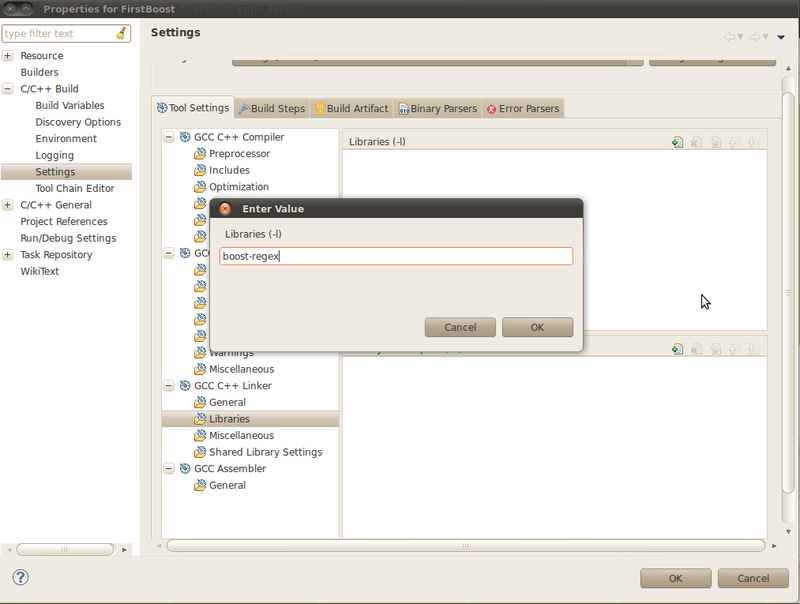 Create a new C++ project in eclipse, select “File->New->C++ Project”. Give a project name and click “Finish”. Note:-all the boost library include files will be present in “boost” folder under your installation directory. Also, all the include files have an extension “.hpp”. 5.) 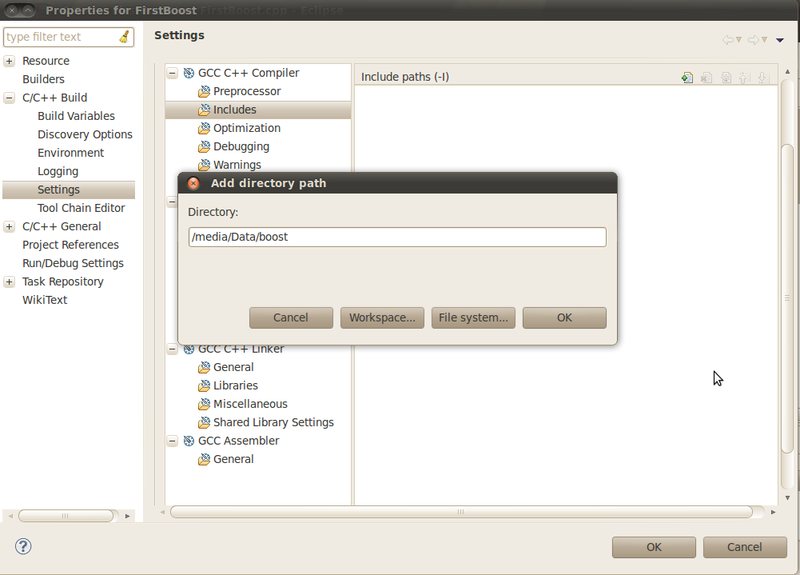 In the settings pane, select “Includes” under GCC C++ Compiler and click on the icon with plus sign on it(Add..). Specify the path where you have extracted boost. Press “OK” and again “OK” on Properties window. 6. )Before you can run the program and see the output, you have to build the code first. Select “Project->Build Project”. You can now try using other header only libraries like “lambda” which provides the facility of anonymous functions. 1.) Go to boost installation directory. You can use –prefix option to change the installation directory from default[/usr/local]. You can use this script with several options like “–show-libraries” will show a complete list of libraries that can be build. Use to “–help” to see all the possible option to this command. This command will install Boost binaries in the /usr/lib/ directory. It is recommended that you use –with-<library> to compile specific library eg. :- –with-regex will compile only “regex” library. The output of this command is too large which might make you miss any errors, hence “>build.log” is used to direct the output to a log file and “2>&1” is used to direct all the errors to your screen. 5.) Perform steps 4-5 mentioned in <b>Using Header-only libraries</b>, so that gcc knows where to find boost headers while compiling. Note:- If you followed the instruction in this guide then boost libraries should be present in /usr/lib folder with names in format:- libboost-<libraryName>.<a/so>. To link any of these libraries, we use -l option of gcc. A common mistake while linking is to use the complete name of the library with extension eg:- -llibboost-regex.a, which generates a “connot find file” error. Please make sure to remove “lib” prefix and the extension. 7.) You’re now ready to run your first boost regex program. Build the project and click on Run->run. Body: This program will find subject line from any input. 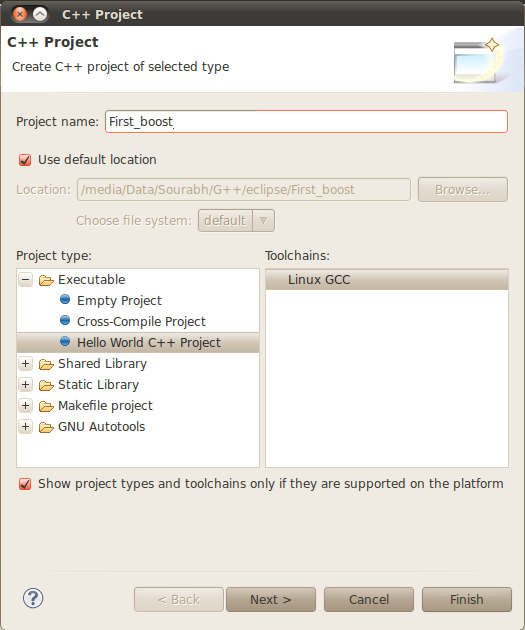 If all the instructions are followed as specified then you should be able to use boost libraries with Eclipse and Ubuntu(10.04).